Does Counting Cards Really Work? Card counting is a very popular concept in blackjack and poker, though many new players have a lot of misconceptions about card counting that need to be cleared up. The biggest question, of course, is whether or not it works – and whether or not it’s worth taking the time to learn. Essentially, card counting is a strategy that involves players keeping mental track of the cards that are played during a card game like blackjack or poker. It’s been used by a variety of professionals such as Blair Hull and Ed Thorp. And while card counting clearly requires a very sharp memory and a quick eye, can it actually work? There are a lot of reasons most players shy away from card counting, but it can work if you really take the time to master it. Here are some success stories of players that made out like bandits by counting cards. Josh Axelrad was on a blackjack team in Las Vegas. He learned the art of card counting and helped his team win hundreds of thousands of dollars. In 2010, he wrote the book Repeat Until Rich: A Professional Card Counter’s Chronicle of the Blackjack Wars, which teaches other players the fundamentals. The MIT Blackjack Team was a group of current students and graduates of MIT, Harvard, and other Ivy League universities who used card counting techniques to successfully play in casinos from 1979 to the early 2000s. The players invested a lot of time into learning the basics of card counting. Five years after the team was founded, the players had earned over a third of a million dollars. They actually stored their winnings in garbage bags while traveling on public transportation to avoid attracting muggers. Jeff Haney was a popular card counter in the early 21st century. He was invited to a number of special events for high rolling blackjack players due to his success. His escapades are documented in a number of journals on the Las Vegas Sun website. Many people believe that card counting is cheating and therefore, illegal. This isn’t the case. Card counting is a skill that few people can master, and criminalizing it would essentially make it illegal to think while playing (not a very reasonable expectation). Casinos don’t necessarily care if you try counting cards either. However, they do care if you are successful at it. Talented card counters won’t be arrested, but they can be promptly banned from the casino after the house catches on. Players need to switch tables and casinos frequently if they don’t want to get banned. Card counting can be a good strategy to follow at a traditional casino, especially for games with four or fewer decks. However, it isn’t possible online, because the casino automatically reshuffles the deck after every hand. You’re better off taking advantage of great bonuses and following the basic rules of thumb to maximize your odds of winning. Card counting is difficult enough when you’re playing with a single deck. It is exponentially harder if you are playing with multiple decks. 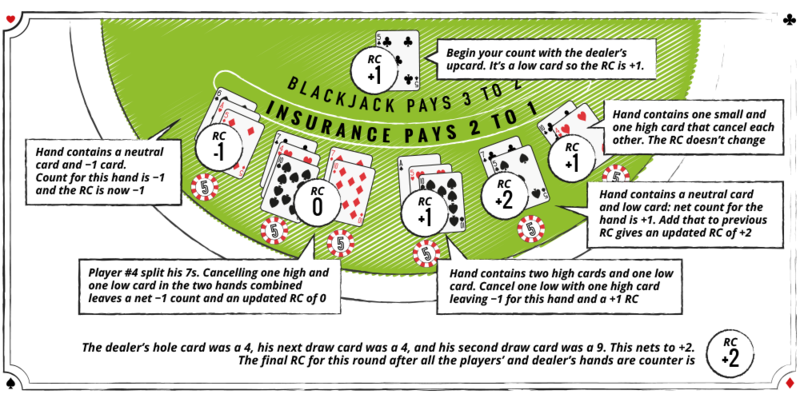 Since most casinos use four to eight decks for blackjack, keeping track of cards can be extraordinarily difficult. Even if you can master card counting with traditional blackjack, that doesn’t mean you will be able to do it successfully with other variants of the game. For example, card counting may not be as effective if you are playing Spanish 21 blackjack, since players have a number of unique options (like being able to split up to four hands and trying to match the dealer). Other strategies may prove to be more effective, which is why few card counters consider playing Spanish 21. It could still work with a smaller deck, but it’s not usually recommended for new card counters. What is the Best Card Counting System? *You start off with a running count, which is initially set at 0. *Every time a new card is played by the dealer, you need to adjust it incrementally. If the new card is anything from a 2 to a 6, then you add one to your true count total. If it is a 10 or a face card, then you subtract one from your total. Other cards don’t have an impact on it. *Divide your running count by the number of decks in play. You’ll want to raise your bet as your true count increases. How much should you raise it by? It’s pretty subjective. A lot of classic books on card counting have some very strict formulas for it, but you should probably refrain from using them. Casino managers are familiar with them and can catch on quickly if you’re using a common card counting practice. You’re better off finding your own method and sticking to it.